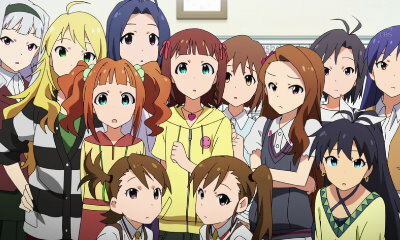 The Idolmaster: From the beginning of the episode, it felt like a reality show of the lives of these 13 girls who aim to be Idols. The "cameraman" interviewed the girls without any voiceover was a typical method done in most reality shows. Those who watch Xenoglossia which is the alternative universe might have to throw all that as these is no rivalry or emo moments. Makoto is not competitive, Iori is annoying, Yaori is hardworking, Ami and Mami are brats. They even include the three girls from the supposedly rival company in this story-Miki, Hibiki and Shijou which are fresh characters not included in Xenoglossia. 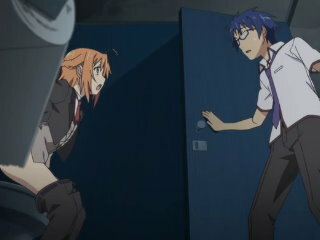 When they discovered the "cameraman" is the new producer who is voiced by Akabane Kenji, their expressions is priceless! I play a bit of the game on PSP but was not into it however this show will make me interested to know more about the girls. 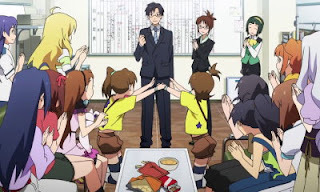 Usagi Drops: I should say this is the sleeper hit of the season! Daikichi returned to his grandfather's funeral and discovered his grandfather has an illegitimate daughter named Rin for a few years. 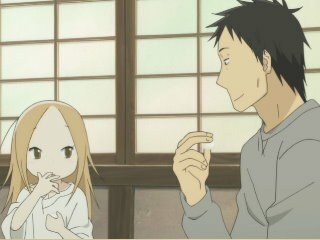 Rin's biological mother dumped her at their home which immediately Daikichi shared a connection with the little girl. 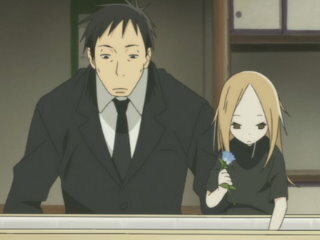 I like this scene when Rin placed Bell flowers on the coffin which is simple but yet powerful.